CCMP - Learning animation thread. Well here is a thread to post your progress with animating the assets of our Carrara movie project. Here is my first try with just the skeleton .. I found the biggest thing to start off with is the layout of the windows and how to make selecting bones and the sequencer items the easiest. After doing this and getting used to being precise when selecting bones and then moving them I could concentrate on animating the rig. I am making progress but for whatever reason the right elbow/wrist in the Man animation goes wonky .. The keyframes seem okay but when Carrara tweens it strange things happen. Have you tried right-clicking to select the bone? I've not tried a Carrara rig before. Can't wait to dig in - but I have to wait for a test render to finish first. Yeah... I've heard many complain regarding animating in Carrara - I find it blissful. I right-click near the bone in question. Especially with Genesis, if you right-click directly over the bone, it's name won't be included in the list, but its wireframe will. You don't want to select wireframe, but the name of the bone itself. I also find it to be a lot more beneficial to sit back and visualize the motion long before selecting anything. Rather than letting IK do all of the work, I choose to work opposite, by rotating joints. All sorts of katterwonky things can happen when you just click and pull. reminds me of a friend I know. Aside from the hand flicker, you've got a great cycle there! I'll just leave you to it - I'm busy enough anyways. If you need my help, however, don't be afraid to give a holler! My biggest issue is when I select the Root bone of the character (pelvis) and then try and move it up or down using the Manipulator handles. Alot of the time when I click the z axis of the manipulator to move the root bone I end up selecting and moving the bone higher up the skeleton. In doing my tests I was seriously thinking about rotating the joints and not using the IK , so it is nice to know that you can do it this way as well. I think we will need many people who can animate so more the merrier. My strength would be modeling, I was basically doing this for a learning experience. Hopefully the more people who know how to animate and rig in Carrara the better off we will be. When you are less busy by all means please take a crack at this. Heck yes, then. I'll be cracking at it very soon, indeed. Argh... that sounds like a PITA... oops... I mean... bummer! Say, if I don't get time tonight, 'cause of this dumb Dynamic Hair thing I'm trying to lock down, I'll work on this tomorrow for sure. 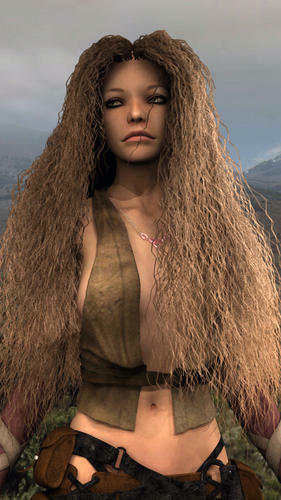 I can't use dynamic hair on Rosie if it isn't curly. But making it curly seems to make it blink - or whatever shaky thing it's doing - so I play... and I play... and I play some more. But the only way to test it is to render it. If I don't see improvements on this test, I'll drop that idea for now. For the bone selection issue,. switch to a quad view or split view, then you can use one view, like the left view, to zoom in close to that bone, and the movement arrows will be smaller and easier to select without selecting another bone. and you can still see your full figure in the other View's. One question,. Why is the figure 60ft tall. ? Also,. the Quad view is much better for animating, as you can see the figure from different views and work in any of them. When I'm doing a walk cycle, I'll usually animate a Static "walk in place", simply because it's easier,. then add the Hip / Pelvis "forward motion", or.. use a walk path to control where the figure goes. Switching to the Graph editor for the hip, allows you to adjust in much smaller amounts than using the mouse in the scene view,. also the motion tab (numeric input) can be handy to adjust the position of the hip. Alot of times when I model I pay no attention to scale I just eye things and I forgot to scale him down before doing the skeleton. I scaled down the skeleton and it seemed to work after trying several things without distorting the rig. I will upload the new link to the file shortly. I enjoy perspective view to be large as well. I usually use the directors camera with a lot of rotating around, and select, then punch '0' to put me right where the action needs to be. "Set position to'" with a few choice extra cameras in the scene to really nail it. I like the flexibility of the model so far and find that I don't share the irritation on selecting, although I've found right-click to be even more awkward than with Genesis. So I'm just point and left-click to get the part - and even the little knuckles in the hand haven't been giving me trouble... but, again, I'm in single pane Director's Cam. I'm not experienced at all with weight painting in Carrara - and wish I could get the arms to lay closer to the body without distorting the shirt. Also, the whole left arm is messed up. Moving the shoulder leaves the hand in place and wrecks the model at that point. If someone could give me the quick low-down to make the above mentioned fixes to the man's skeleton and just a quick procedure on weight mapping access, I'd almost prefer to make the corrections myself, without a lot of digging for information. This would be great stuff to learn. Love that model, too! However, this is a classic example of how much I enjoy Millennium. They seem to be the darned easiest figures on the planet to animate. I don't even see the bones of a millennium figure - making them very fast to work with since I can see them - and their shapes - so much better. I understand that this is an exercise for doing everything in Carrara - and I'm really grooving on the whole thing - great experience thing. But one of Carrara's biggest strengths as an actual 3d modeler, is how well and easily it works with purchasable content. Just sayin'. Not nothin' else on the market does what Carrara can it these respects. Nothin'! Now that my rant is done, I just want you all to know that I'm not asking to use millennium people. I was simply saying that showing off Carrara can also be showing off it's strengths and uses. Perhaps as a different project that we can enjoy. This project - even just the "Easy Come and Easy Go" primer - is fantastic. I'm really proud of the models I've opened from Mike, Roy, and Andy. This is some really cool stuff. If nobody has a quick tutorial on hand, I'll figure out what I need to know. I have plenty of resources, just not so much time. It will take you weeks to get a decent walk cycle. There is much involved. Don't even think of doing a multi cycle walk. Stick to one left en one right step and use NLA. Every movement of every bone has to be at the right time. Sounds easy, but it is not. If you do a walk in place, the hip still goes up and down at specific intervals. But the feet has to stay on the ground. So compensation with bending. A good walk has rotation of the hip. This means the legs turn in and outwards and you have to compensate that. The feet have to stay in the same place. Same for the upper body. It rotates the opposite of the hips and you have to do some compensating of the arms. Getting a smooth waving of the arms, is not easy. The heads rotates with the upper body, so you have to correct that. If you have a smooth moving foot, you think you're done. Well you are not, you will get foot sliding. You have to solve that. Left and right has to be the same. You could use Fenric's Pose Helper to a certain level. The left arm and the right leg do not move at the same time. There is a bit of a time difference, otherwise it looks robotic. After spending many hours, you will get a walk that is not so bad. But you still will think very often "There is something wrong, but I have no idea what." If you don't believe it is complicated, import a BVH walk and watch it in the Graph Editor. Click on each bone and see how much you have to do manually. Even if you know when you have to do what, it is still a lot of work. If you correct a left step, you probably have to do the right step immediately also, otherwise you will be completely lost. I have given up on doing this. It is much too complicated. I stick to BVH, Aniblocks and Poser Walk designer. I agree with much of what you say here,. but at the same time, I disagree, simply because many things can seem difficult and time consuming when you're just learning how to do it. Your points about hip rotation and swivel as well as the up/down movement, combined with feet /toe bending are spot on. But the point about not attempting a multi-step isn't . In Carrara, "and most other animation programs" , it's very easy to copy and move the key-frames to add more steps. one thing lacking in Carrara is a "Mirror" pose function,. although Fenric has a plug-in with that in it, it's something which should be in any animation program. Puppeteer is also Very useful for "recording" a pose,. then you can apply that pose to the figure further down the timeline. So, with a few recorded poses,. it's much easier to create a multi-step animation. Also, for different parts of the figure, you'll ideally want to have specific types of tweeners being used,. As far as the time taken, ...that's a matter of experience and practice,. the more you do it, the easier it becomes, .. and the faster you're able to do it. Pjotter speaks the truth. A wise man. Human motion by hand is indeed a skill and tremendous undertaking to achieve. And the bad part ---the real bad part is we "see" it everyday for our entire lives........and when we see it trying to be duplicated in 3d --the oddities stand out . Now that said ------I think if one attempts animating only for a movie shot . And uses the camera well..........it can be done reasonably well enough to keep the audience on the story and not on the less than perfect animation. It still is hard --very hard but what isn't. Smiles. Yes, I used the Directors Camera as this has several advantages over the Camera View , one being it is not animateable and because I only had 3 views I tended to rotate around in the Directors view as well. For my model rig, Did you delete all the IK targets or are you using the IK targets to animate with.? I know that file had the "Use Constraints" icon turned off . What you could do is check the bones that the IK targets are connected to and make sure they are enabled, I know one of them wasn't (I think Right Hand IK Target). Then make sure the "Use Constraints" icon at the top of the GUI is turned on. If you deleted the IK Targets did you do this before you attached the rig to the mesh? I guess just check the bones for the hand and other 3 Ik target bones and make sure the links in the Modifier tabs are deleted before attaching the skeleton to the mesh. For the arms distorting the shirt mesh , I had thought the "bones" I did for the Pec or chest area could be used to pull the mesh away from the arms when lowered. You could try this and see if it helps. I realize animating a walk cycle is difficult and I don't know anything about using Aniblocks for Carrara on custom characters . I do know that learning to do a walk cycle will come with practice like 3DAGE says and then it will seem much easier the better you get at it. I think you need people using carrara that actually animate walk cycles and stuff with it to push the animation toolset forward. I am sure our first attempts at animating the characters won't be spectacular but we will learn alot in the process. I am not totally opposed to using aniblocks/bvh but would prefer to do it in Carrara. 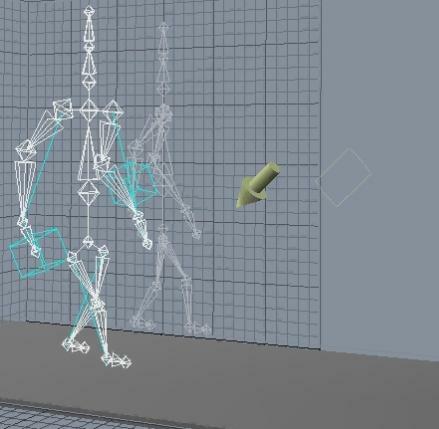 Thanks for your input as you have shown us some things to concentrate on when animating the walk cycles. Just thought I would post this interesting video on animating a walk cycle of a horse, sort of interesting . another couple of youtube videos , check out this youtuber's other videos which seem to be great for animators. 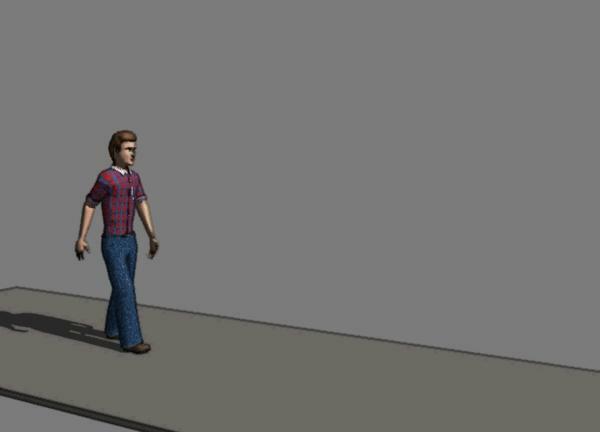 To me having this video or other similar guides in the Front and Side views would help alot in getting realistic walk cycles in Carrara. It all matters where you draw the line. If you are not in a hurry or you want to learn every detail of animation into depth, go ahead. But if you want to produce animation and spend time on other issues, you have to think things over. You cannot compare it to learning to walk or juggle. Once you know it, you know it. If I stand up, I can walk. This is not the same as creating walk cycles. Yes, you will improve and you can do it faster. But getting a good walk stays a tedious job. See how much keyframes are involved and they need to be timed exactly right. Only after spending many hours, it isn't a woody walk anymore, left and right are the same, you have no foot sliding. Walking is very easy, creating a good smooth walk cycle isn't. I have walked through my living room, thinking when am I moving what. How far and when is my hip rotating. How do I put my foot down. Do you know how your spine is rotating during walk? (Think about this only). Have you thought about your balance (left/right, forwards). It will be a bit like this: "That is not bad, but I need a bit more hip rotation." But then you also need to readjust all leg movements again. And you will have foot sliding again probably. With a different hip rotation, you upper body follows and probably not right. If you character needs to run, will take you weeks again. It has to walk on tiptoe, more weeks. I am not even talking about different characters. I have tried it and because now I know enough about this, I am not going this road anymore. For me it is Poser Walk Designer > Carrara > NLA. I have to make small adjustments, but my character is running within half an hour. And he is running exactly as I want him to run. And the smoothness is almost impossible to do by hand. I agree, but you didn't understand me. You create a one step cycle and multiply it by copy/paste or NLA. You shouldn't try to create manually 10 steps in a row. You create one. Maybe I wasn't clear on this. One thing about bezier and linear. It is all about easy in and out. It is about when and how much. But some are misunderstanding this. If you have for instance bend arm and the first keyframe is the start and the second and last frame is the end, then yes, you need bezier for a fluent and natural movement. BUT if you have several keyframes in between (like BVH on every frame), it doesn't really matter if you use bezier of linear. You really don't see the difference between frame 33 and 34 using bezier or linear. Should there be easy in and easy out between frame 33 and 34? No. Maybe it is even wrong. The ease in is only for the start of the movement. Not for the middle of the movement. It is all about the keyframe line (the line through all keyframes) from start to end. It should be waved shaped. You can get the same keyframe line with a two keyframed bezier, or with multiple linear keyframes (just put them on the right place). With linear you can also create your ease in and out. But only if you have multiple keyframes between the start and end of the movement. Once again, if you only have a start and an end keyframe for one movement, you need bezier to make it fluent. You make it sound impossible to do a decent walk cycle. Do you mean only in Carrara because of lack of tools? I tend to get the impression that doing walk cycles in 3d would be easier/quicker to do than drawing a character walk cycle by hand. We all know people can hand draw walk cycles by all the cartoons we have seen for ages so using 3d tools should work for this as well. Also, do you know if you can apply a bvh created in poser(or aniblocks) and use it on a custom rig like the character we are using? No, it is not impossible. It is only very complicated. It looks easy. It has nothing to do with Carrara. Maybe Carrara is even the best tool for this. Think only about this. Do you know how and when your spline or your right foot moves during your walk. Probably not. But you have to know this if you want to create it. Building a castle with box modeling is doable if you start learning it. But they are all straight lines and you don't have timing issues. A walk pose as a cartoon is doable. A 2D walk cycle is a lot "easier" as a 3D walk. You have little hip rotation issues, you don't have to shift l/r weight, knees / feet can't wobble inside. And don't forget, Walt Disney, etc are experts. They have large teams. Todays 3D animations are done by hundreds op people (very often India) and they are specialized in only a very small section of animation. Yes, Poser BVH or aniblocks can go direct into Carrara. You can attach them direct to the skeleton. Using Carrara's NLA is an extra step, but a lot easier. Study NLA, because this is a huge time saver. NLA is bit like Aniblocks. But the skeleton is very important. I tried creating a skeleton manual and it worked. But also not easy. Somehow, some things do not go well. It has to do with naming the bones and their default rotation angles and constraints. Then I tried using a skeleton from the 2500 file collection. Wasn't bad, but not easy. The thing that worked best for me, is taking a skeleton from Victoria and inserting it in my character. I have hardly any problems. If you are doing this, don't rotate the main skeleton before attaching. You can rotate arms, hands, legs and head in place. But do not rotate chest, abdomen, shoulder. Because as soon as you start attaching BVH, you get deformations. Hey, thanks for this. Like I said, I'm new to using Carrara rigs and never even attached a skeleton before. Carrara sure makes it easy, huh! I'll check the above mentioned this time. Say, can I just delete the targets? I'll try that one first. I try to follow what you're saying, but it's still strange to swallow for me in just so few words. I'll likely nail it with a smack on the forehead as soon as I see what you meant, IN Carrara. Pj, Yes. It's like 3dage said about walking. But you're very correct. Many people don't put enough effort into a walk cycle before calling it finished. I just wanted to add that most people's right and left are NOT the same. That's where it may still not look right. Individualism follows through into they way people walk. I never mirror the pose. I do both sides from scratch, which automatically creates a certain difference between the two halves. This really helps to create a natural feel to the walk, even if you tried hard to make them similar. These things still take me a long time to do too... I'm still relatively new to it. That's why I use aniBlocks too, to save gobs of time - and just tweak from there. In this model, the names aren't the same. But even if I renamed them, I fear that an aniBlock would not produce satisfactory (or even tweakable) results as the skeleton is so different from a mill figure. Not really as bad as he makes it sound. It is more like 3dage's analogy of learning to walk. When you see these pro animators, they can have the base walk done in an hour. Why? because they've been assigned to a specific character and they know how it behaves and how it's feeling. Their experience in animation takes over and they know their procedure so well that there is an utter lack of confusing towards what to do next. Grab, drag and move on. They are VERY fast. They have to be. Look at the walks in Star Wars: The Clone Wars on cartoon network. Each character is a true individual. It helps that they each have a different animator. Each a trained, experienced professional who knows how to work fast while achieving life-like results. I drool over how Asohka starts with a bit of a bounce-walk before erupting into a quick run to catch up to Anakin before going back into her young walk, which she has to speed up from time to time to keep up with him... it's just like watching an older and a younger sibling walking together - where the younger one truly admires the older one. The problem with walk cycles that have been purchased, is that everybody will start walking the same way. That's where I wish Carrara had a walk cycler like Poser. That thing, as Pj mentions, Rocks! Does it this mean you are not using Walk Designer in Carrara? Create your walk in Poser, send it to the character, export as BVH and import in Carrara. That is all. I can never get enough links of this kind. I enjoy watching and learning from this stuff. The head modeling links you put up on the other thread were incredible. You could clearly see how each artists workflow was correct, yet different. I think I'll make some links indexes in the Carrara manual thread I have going. This stuff (and the head modeling) is invaluable no matter what software you use. Thanks for these links. Very beneficial. I have never really liked using the BVH format, for some reason. When I used to use Poser's walk cycle, I'd simply save out a looping, animated pose. I've also used the motion path and made moving walks and runs and saved those as animated poses as well. But, yeah... same thing. I haven't used it in a while, but I've had such great results, I'll never hesitate to do so when needed. I have never really liked using the BVH format, for some reason. Yeah... I don't care for this skeleton. It is very difficult to get a natural pose from it. I'll try may hand at making my own. Okay, I'm never going to get MY work done messing around with this in this state. I've made my own skeleton and all is fine, except that going for a more precise weight mapping for the joints is frustrating me to no end. The painting goes fine, but then, apparently, subtractive mapping reduces the influence too much from its parent joint - leaving bits of the mesh behind when the parent moves. This is unacceptable and is taking me far too much time for a simple exercise. If I had more information on how this should be done, or if someone else got the thing ready first, no problem. But I have too much work to do, leaving no time for this at the moment. I am the only bread winner in the household right now and the bills must be paid. At first, it truly looks like when you subtract from this, more gets added to that - removing the problems that are occurring. But that's not the case. So What I'll have to eventually do, when I get a lot of hours (due to how slowly these brushes seem to work) is to paint heavy influence from the shoulder down through the tips of each finger... argh... that won't work either... because it'll be subtracted when I fine tune the finger joints. This is my weak point. I just found it... this is it.